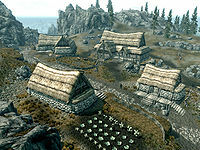 Rorikstead (also known as Rorik's Steading, or Rorikhofkah in the Dragon Language) is a small settlement in the Western Plains of Whiterun Hold. Some variant of the name appears in many old records, with the earliest dated mention of it being in 2E 373. The traditional song of Whiterun, "Ragnar the Red", refers to an "ole Rorikstead". During the Skyrim Schism, Rorikstead was part of Western Skyrim. A number of years prior to 2E 582, Falkreath Jarl Hjurgol Skjoralmor's wife and daughter stayed in the town on their journey to High King Svargrim's coronation in Solitude, and were ambushed by a Giantess' herd of mammoths shortly after. The land around the settlement was purportedly barren around the time of the Great War. After the war, a local nobleman named Rorik purchased the land. He claims to have founded the settlement, and that it hasn't had a bad crop since. The local farmers make a living by trading their produce to merchants in Whiterun. The dragon Nahagliiv, who was buried in a mound west of the settlement around the time of the Dragon War, was resurrected in 4E 201 by Alduin. Rorik's claim that he founded the settlement is hard to reconcile with the historical record, though it is possible Rorikstead was abandoned and later re-founded. ^ Rorik's dialogue in Skyrim.